What need will you address and how? When you begin writing your grant proposal, your first goal should be to answer that all-important question: What is the need that my organization will address with this project? It can be helpful to start with your needs statement when you address that. Winning Grants Step by Step by Tori O'Neal-McElrath provides a wonderful outline for preparing an effective needs statement. The author says that the statement should convince the funder that your project meets a critical societal need. What Does a Needs Statement Include? An excellent needs statement grabs your funder's interest using both facts—quantitative data—and stories—qualitative data. The need you address must clearly relate to your nonprofit's mission and purpose. It should focus on the people you serve, not your organization's needs, and it should be well supported by evidence such as statistics, expert views, and trends. 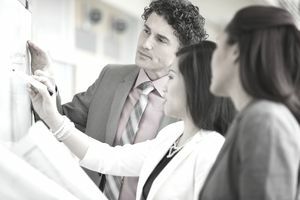 It must directly connect to and support your organization's ability to respond to that need, and it must be easy to understand. Use the KISS principle: keep it sweet and simple. Your needs statement should avoid circular reasoning, a common error in grant proposals. The Foundation Center defines circular reasoning as claiming that the absence of your solution is the actual problem. Then your solution is offered as a way to solve the problem. For example, "The problem is that we have no senior center in our community and building a senior center will address the problem." Winning Grants provides these suggestions for writing your needs statement. Use statistics that support your argument as well as comparative statistics and research. Citing a community that did something similar to your proposal and its beneficial results makes a strong case for your proposed actions. Document all your data. If you collect information from the Internet, be sure the websites you reference are reputable and that the links are current. Quote authorities on your topic. Include names of the sources so the information can be verified. Use stories but anchor the stories in hard facts. And make it urgent. Help the funder understand why funding is critical now. Resource Associates, a grants consultancy, adds these caveats for grant writers working on needs statements. Make double sure that the needs you address are aligned to the funder's goals. Sort out the main problem you will address and don't get sidelined by small, contributing problems. Make sure your data is the most recent. Use up-to-date census numbers to provide a snapshot of your community and paint a picture that speaks to the heart of your story and the people you're trying to help. Use the data to support that human story.